Russia's bailiffs seize about $12 million allegedly linked to Kolomoisky’s bank | Russian Legal Information Agency (RAPSI). MOSCOW, December 26 (RAPSI) - Russia's Federal Bailiff Service announced on Friday that 191 million Ukrainian hryvnia (about $12 million) linked to Privatbank of Ukraine's billionaire Ihor Kolomoisky have been seized. Many clients of the bank residing in the Republic of Crimea lost their money as the bank stopped operating in the region after the republic broke away from Ukraine and voted to join Russia. In November, a court in Crimea's capital Simferopol ruled that Privatbank owed its clients in the region 10.9 billion rubles (about $214 million). Crimean clients of the bank are represented by a special fund established by Russia's Deposit Insurance Agency. The Crimean parliament ruled in early September to nationalize property owned by Kolomoisky on the territory of the republic. 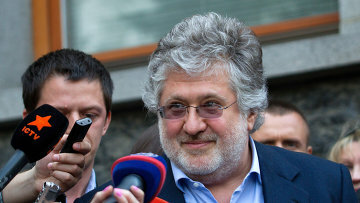 Kolomoisky is accused of masterminding murders, using prohibited methods and means of warfare, abduction, and other crimes linked to the armed conflict in the southeastern regions of Ukraine. A criminal case against Kolomoisky and Ukrainian Interior Minister Arsen Avakov was opened on June 18. Arrest warrants for both of them were issued soon afterwards. 17:05 26/12/2014 Russia's Federal Bailiff Service announced on Friday that 191 million Ukrainian hryvnia (about $12 million) linked to Privatbank of Ukraine's billionaire Ihor Kolomoisky have been seized.